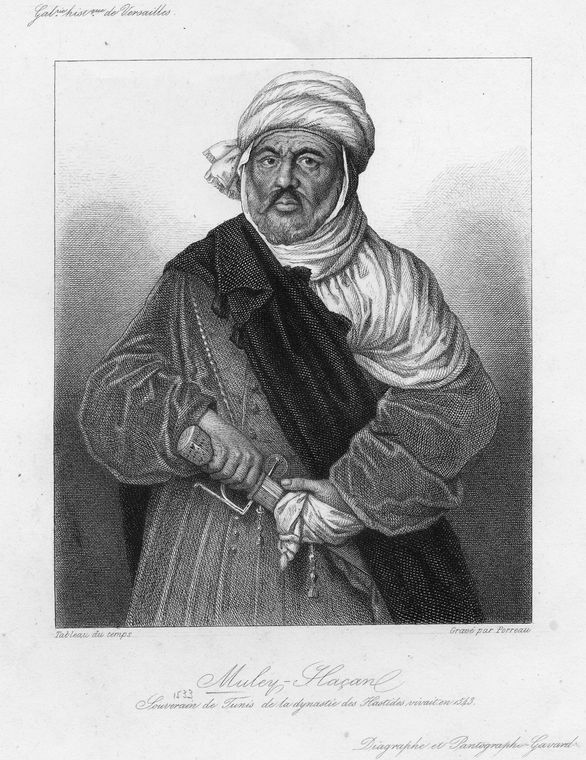 Abu l-Hasan Ali, also called Muley Hacén, father of Boabdil. [Muley Abul Hassan] had ascertained that the captors of Alhama were but a handful: they were in the center of his dominions, within a short distance of his capital. They were deficient in munitions of war and provisions for sustaining a siege. By a rapid movement he might surround them with a powerful army, cut off all aid from their countrymen, and entrap them in the fortress they had taken. As the army approached the town, they beheld the fields strewn with the dead bodies of their countrymen, who had fallen in defense of the place, and had been cast forth and left unburied by the Christians. There they lay, mangled and exposed to every indignity; while droves of half-famished dogs were preying upon them, and fighting and howling over their hideous repast. Furious at the sight, the Moors, in the first transports of their rage, attacked those ravenous animals; their next measure was to vent their fury upon the Christians. They rushed like madmen to the walls, applied scaling-ladders in all parts, without waiting for the necessary mantelets and other protections,—thinking, by attacking suddenly and at various points, to distract the enemy, and overcome them by the force of numbers. The Marques of Cadiz, with his confederate commanders, distributed themselves along the walls, to direct and animate their men in the defense. The Moors, in their blind fury, often assailed the most difficult and dangerous places. Darts, stones, and all kinds of missiles, were hurled down upon their defenseless heads. As fast as they mounted, they were cut down or dashed from the battlements, their ladders overturned, and all who were on them precipitated headlong below. Muley Abul Hassan stormed with passion at the sight; he sent detachment after detachment to scale the walls—but in vain; they were like waves rushing upon a rock, only to dash themselves to pieces. The Moors lay in heaps beneath the wall, and among them many of the bravest cavaliers of Granada. The Christians, also, sallied frequently from the gates, and made great havoc in the irregular multitude of assailants. 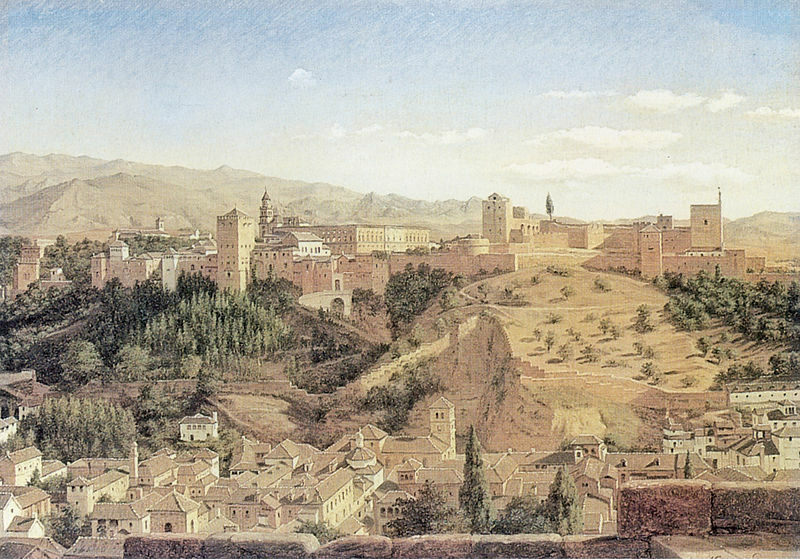 Muley Abul Hassan now became sensible of his error in hurrying from Granada without the proper engines for a siege. Destitute of all means to batter the fortifications, the town remained uninjured, defying the mighty army which raged and roamed before it. Incensed at thus being foiled, Muley Abul Hassan gave orders to undermine the walls. The Moors advanced with shouts to the attempt. They were received with a deadly fire from the ramparts, which drove them from their works. Repeatedly were they repulsed, and repeatedly did they return to the charge. The Christians not merely galled them from the battlements, but issued forth and cut them down in the excavations they were attempting to form. 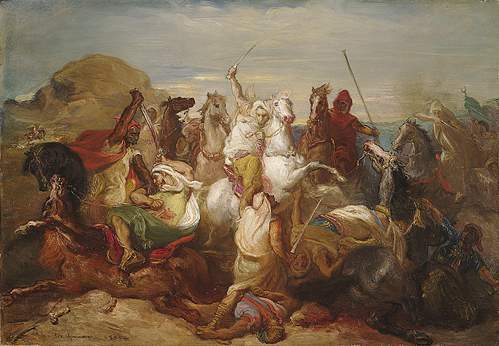 The contest lasted throughout a whole day, and by evening two thousand Moors were either killed or wounded. A desperate conflict ensued on the banks of the river, the Moors endeavoring to plant palisades in its bed to divert the stream, and the Christians striving to prevent them. The Spanish commanders exposed themselves to the utmost danger to animate their men, who were repeatedly driven back into the town. 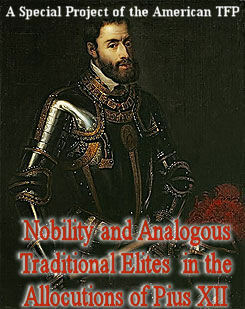 The Marques of Cadiz was often up to his knees in the stream, fighting hand to hand with the Moors. The water ran red with blood, and was encumbered with dead bodies. At length, the overwhelming numbers of the Moors gave them the advantage, and they succeeded in diverting the greater part of the water. The Christians had to struggle severely, to supply themselves from the feeble rill which remained. 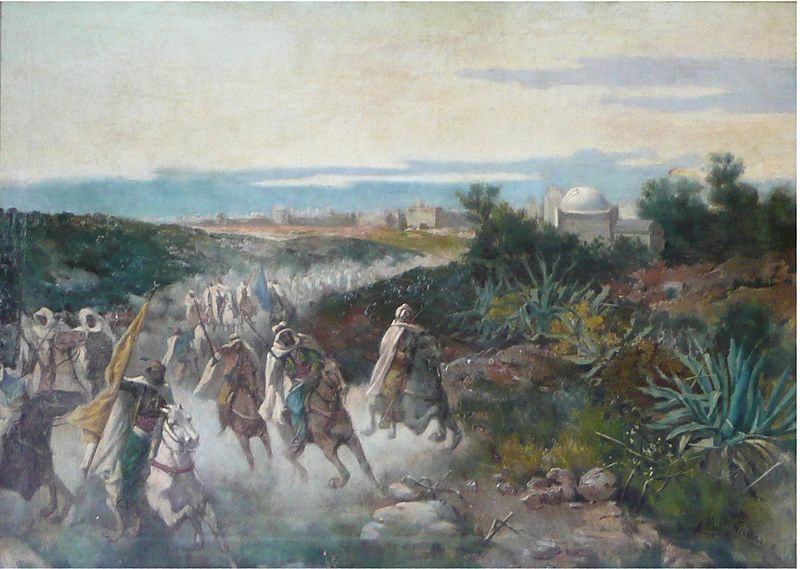 They sallied to the river by a subterraneous passage; but the Moorish crossbowmen stationed themselves on the opposite bank, keeping up a heavy fire upon the Christians, whenever they attempted to fill their vessels from the scanty and turbid stream. One party of the Christians had, therefore, to fight, while another drew water. At all hours of the day and night, this deadly strife was maintained until it seemed as if every drop of water were purchased with a drop of blood. In the meantime the sufferings of the town became intense. None but the soldiery and their horses were allowed the precious beverage so dearly earned, and even that in quantities that only tantalized their wants. The wounded, who could not sally to procure it, were almost destitute; while the unhappy prisoners, shut up in the mosques, were reduced to frightful extremities. Many perished raving mad, fancying themselves swimming in boundless seas, yet unable to assuage their thirst. Many of the soldiers lay parched and panting along the battlements, no longer able to draw a bowstring or hurl a stone; while above five thousand Moors, stationed upon a rocky height which overlooked part of the town, kept up a galling fire into it with slings and crossbows so that the Marques of Cadiz was obliged to heighten the battlements, by using the doors from the private dwellings. The Christian cavaliers, exposed to this extreme peril, and in imminent danger of falling into the hands of the enemy, dispatched fleet messengers to Seville and Cordoba, entreating the chivalry of Andalusia to hasten to their aid. They sent likewise, imploring assistance from the king and queen, who at that time held their court in Medina del Campo. In the midst of their distress, a tank or cistern of water was fortunately discovered in the city, which gave temporary relief to their sufferings. Washington Irving, The Conquest of Granada (Agapida edition), (New York: G. P. Putnam’s Sons, 1893), pp. 48-49, 51-55. To read the prequel—Muley Abul Hassan, king of Granada, attacks the Christian stronghold of Zahara, slaying and reducing its inhabitants to captivity and slavery— please click here. 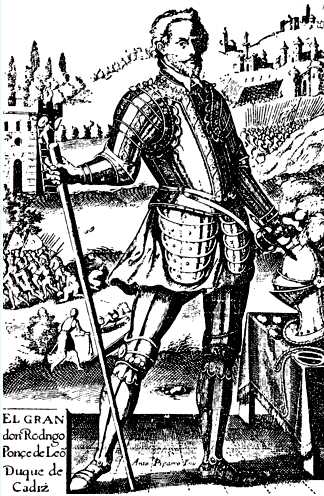 To read the sequel—King Ferdinand and the nobility of Andalucia rush to the aid of Don Roderigo Ponce de Leon in Alhama—please click here. To read how the anguished Marchioness sought help from her husband’s mortal enemy—Christianity quells the fires of revenge and elicits heroic acts of valor and nobility—please click here. The Conquest of Granada was marked by great feats of heroism, but few compare with the capture of Alhama by Don Roderigo Ponce de Leon, Marquess of Cadiz. He decided to carry out this attack in order to wipe away the national disgrace with the loss of Zahara. Alhama lay deep within the Kingdom of Granada, indeed not far from the capital itself. If its capture was sheer audacity, to hold it seemed madness. Yet hold it Don Roderigo would, and his boldness, sent an electric charge pulsating throughout Spain. Few things move the human soul like heroism. And when heroism reaches the point of sublimity, its impact on the population is overwhelming. His wife, a family enemy, the king, the nobility, and the people of Spain rose up as one man and rushed to the aid of the besieged like a lion. How could they be indifferent to the boldness of Alhama’s capture or the mortal peril Don Roderigo and his men were now in? War is not just made of soldiery, morale, tactics, arsenals and supply lines. It is also made with great movements of soul that stir up and energize the heart of a nation.